We offer many energy efficient glass options designed to meet your needs and your budget. What does Low 'E' with Argon, or krypton do for you? An essential all-season insulator, Low 'E' coatings are comprised of transparent, microscopic layers of metal oxide applied to glass. In summer months, Low E keeps cool air in while keeping hot air outside. In winter, Low E keeps warm air in and cold air out. Low 'E' glass also blocks up to 84% of the ultraviolet rays which can fade carpets, draperies and artwork. In addition, a gas, either argon or krypton (harmless gas found in the atmosphere), replaces the air inside the insulating glass unit. Because these gases are more dense than air, it drastically reduces the transfer of heat and cold, adding even more thermal efficiency. 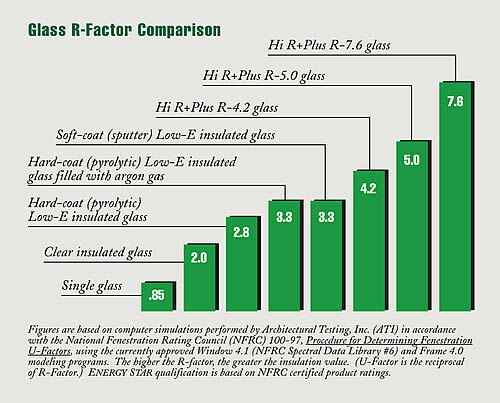 As glass technology advances higher performing Low 'E' glass options have come available as is outlined in this R-factor comparison chart. To better accommodate homeowner needs, regional Low E packages are available to provide optimum performance in all areas. There are two types of Low E coatings, soft coat and hard coat. Both Low E coatings reflect a portion of the sun's rays, but the percentage varies for differing climate zones. Low E soft coat works best in warmer climates, because it reflects a large amount of sun, reducing solar heat gain in your home. On the other hand, Low E hard coat is better for cooler climates as it reflects less of the sun's rays, utilizing passive solar heat gain. Because of these variations in performance Energy Star ratings have been developed to provide the most accurate Low 'E' coatings for specific regions of the country. Our windows and can be ordered to meet Energy Star guidelines.